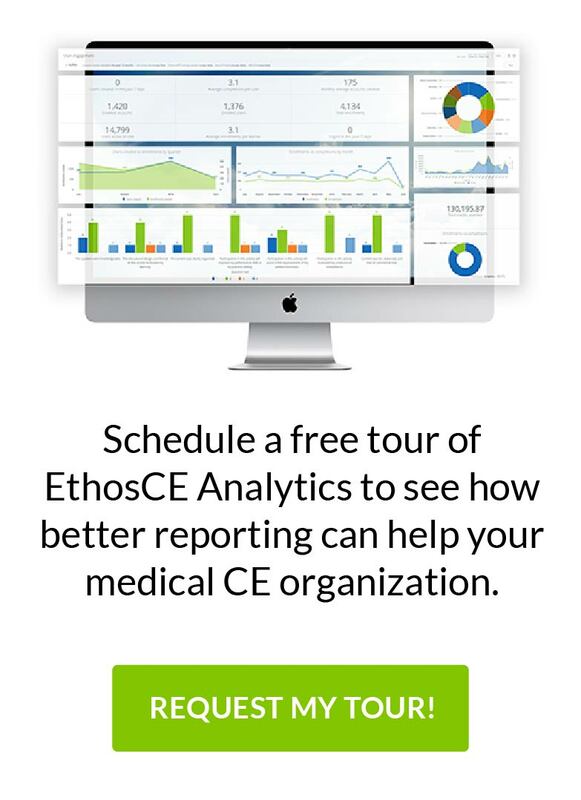 Announcing EthosCE 7.4.4: ACCME + ABIM and more! We are excited to announce the release of EthosCE 7.4.4, the latest update to our learning management system designed for continuing education. EthosCE 7.4.4 provides new features as well as incremental improvements to existing features. This release is available to be scheduled for new and existing customers beginning October 2016. In addition, this will be our last “big” release. After 7.4.4, we are moving to smaller releases deployed more often in order to expedite improvements and more quickly react to customer and market feedback. ACCME recently introduced a web service for its Program and Activity Reporting System (PARS). As a result, EthosCE now provides web service integration with PARS. This means EthosCE administrators no longer have to upload a file to PARS. An activity record is automatically created in PARS when it is created in EthosCE. Your participant counts update in real time! This is an add-on module. Please contact us for more information and pricing. ABIM + ACCME: MOC II credit reporting for ABIM and other boards. EthosCE now provides a credit reporter for ABIM MOC II credit. The credit reporter utilizes the EthosCE credit reporting framework and the ACCME’s integration with ABIM. Physicians can view and update their ABIM diplomate number and date of birth before reporting to ABIM to avoid inaccurate reporting that would increase your customer support. ABP credit reporting is currently in beta testing with ACCME we expect it to be released soon! EthosCE’s robust credit claiming framework allow you to define credit eligibility for your learners. But what if you don’t want or need to define eligibility? Or can’t define it? Now you can allow your learners to select the credit types that they want at the time of credit claiming. This configuration is optional. Existing EthosCE customers will see no change in the credits a learner is allowed to claim. Learners will also be able to opt-out of claiming a credit type if desired. EthosCE now provides an activity application form and related activity management features. This add-on module ships with a default course application form, but allows for modifications to add questions, instructions and help text. Managers can assign a reviewer to an application and both users types receive email notifications and a dashboard to track and manage applications. When an activity is approved it can be converted to a course with one click. This feature will be expanded in months to come to include faculty management, disclosures and conflict of interest resolution. Course administrators will now receive real-time warnings when creating courses with configurations that might not be optimal. If you’ve ever created a course but forgotten attach a certificate then this feature is for you! Warnings will be provided on courses that can never be enrollable, don’t provide credit or certificates, have no required course objects, have privacy issues and other configuration problems. When setting up a reminder in an activity, administrators may want the user to be directed to a specific course object, such as a follow-up evaluation, or a certificate. In EthosCE 7.4.4 there is now a widget that shows all the course objects in the course and provides a deep link to each object that can be easily cut and pasted into a reminder. If a learner clicks the link in an email, loads the page, and isn’t logged in, the learner can enter and username and password and be redirected back to the the learning object. When masquerading as another user now you can switch back to your administrator account with one click. Need we say more? We love this feature! Site administrators can now edit robots.txt files directly in EthosCE. We’ve also provided features to verify your site with Google and Bing directly via an EthosCE interface. Site administrators can now add site-wide CSS directly in EthosCE to make design changes to the site’s look and feel. EthosCE now ships with an out-of-the-box web service role. This role will expedite use of the web service as custom roles may no longer be necessary. The web service supports common use cases such as user enrollments, ecommerce integrations, awarding credit, completing course objects and creating user accounts. We’ve also improved and expanded our web service documentation with more examples and detail. This report allows administrators to download a list of all courses including course field data. It also shows a high-level view of course including credit type and number of enrolled users. This report allows for a download of all the income and expenses entered into the ACCME income and expenses fields. Notification to learners before reporting to external services. Learners who are earning credit to be reported to external boards can now review and easily update their relevant user profile information before claiming credit. We have continued to improve the display of our calendar, including restoring features that were lost when we moved to a fully responsive calendar. Webform reports are now printable in a neatly pre-formatted PDF that includes one question per page. Site administrators may now import updated data to course completion records. For example, if you’ve imported a course completion record with the incorrect date you may now import again and update it. Site administrators cannot delete a course with enrolled learners. Enrollments must be removed first. This change was implemented to prevent accidental data loss. Allow credit types to be disabled. Credit types can be disabled on a site-wide basis and disabled credits types can no longer be enabled on courses. Disabling a credit type doesn’t disable it from a course for which it has already been enabled. It simply prevents that credit type from being enabled in the future. Disabled credit types will remain enabled on existing courses and will always appear in a user’s transcript for awarded credit. They can also be used for imported course records. Add support for attendance to course record importer. Attendance records can now be imported using the course record importers. Change order and name of columns in course record importers. We’ve cleaned up the order and name of columns in the course report importer to make it easier to use and understand. A new template can be downloaded from your importer pages. Add “Enrollment ends” to course summary box. Users can now see when their enrollment ends on the course landing page. Add a ‘re-attempt’ quiz button for failed quizzes. EthosCE will now optionally automatically generate a re-attempt quiz button for failed quizzes. Course administrators will no longer have to add this manually. The button is configurable per quiz and will only appear when enabled. Update course completion page to show list of course objects. When a learner reaches the course completion page, a list of all course objects and their statuses are shown. This makes it easy to get back to objects for review. The course order report now includes coupon codes and discount amount. Change username and email of duplicate user post-merge. After merging users, the old user will have the user ID appended to the username and email fields. This change will help prevent name and email conflicts with identity management/SSO systems that do not enforce unique usernames or emails. Add new reminder type for enrollment creation. Reminders can now be sent based on purchase date, not just enrollment date. Users with the site admin role may now edit the footer. The account lockout time for accounts with multiple failed login attempts is now configurable and defaults to 5 minutes.